What is a creativity blog, anyway? That is an interesting question. One which has taken deep study to realize how best to communicate. Getting it down to the elevator pitch, you know the 15 seconds you have to answer the dreaded ‘what do you do‘? I suppose this is important in tricky situations, particularly if you are dealing with someone who has the attention span of a nat. Maybe this graphic will help. 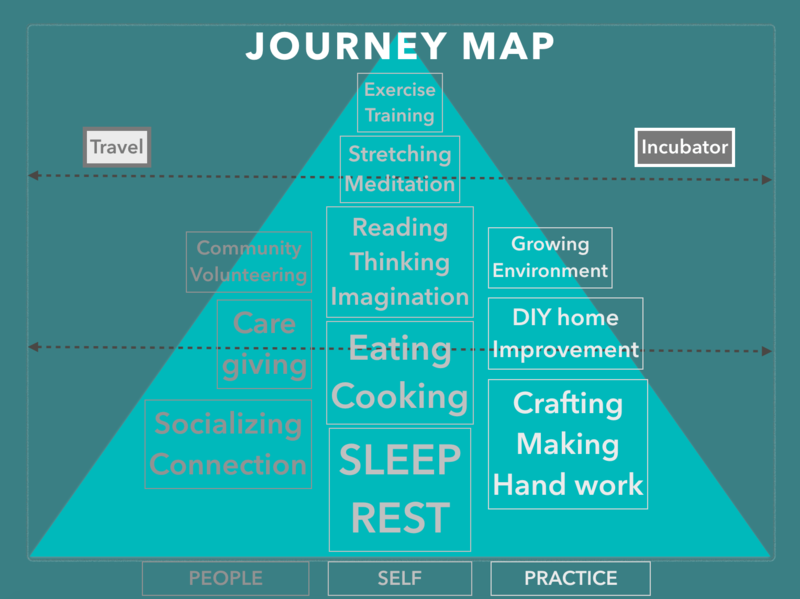 Basically this is a ‘journey map’, an overview of the ways to discover and benefit from the content of this creative blog. There are 3 silos running vertically which represent the main categories, with 2 special ones off on each edge. You might argue that this represents how people live and doesn’t have anything to do with creativity per se. While that is not wrong, when I speak with people who self identify as being creative, they emphasize how creativity touches everything in life, not just a single project or activity. I whole heartedly agree with that description for creativity. If we use it well, creativity can benefit and support us in so many ways. The size of the boxes and the lower placement in the pyramid represent the importance and the amount of time we might spend on these activities. I think each person could create their own schematic, maybe one to show where you are and another as a goal for the future. This one is based on my experience and research. Back in 2010, the year I turned 40, I knew something needed to be different, for me. It was a classic mid-life crisis, I guess, looking back now. But whatever the reason, I decided to move away from living on auto pilot and started taking charge of my life. I wanted to be happier. I wanted the good life that I was sure I didn’t have. I wanted to be moving towards a future where I would look back on my legacy and be proud of what I had accomplished and who I had helped. I started in the bottom middle and mostly ran up the centre, with little jigs and jogs to either side. I only travelled for work, so that was almost an extension of my office, (didn’t count). I had no incubator and quite frankly felt so overwhelmed, I would have been resentful of anyone who suggested I needed one. My progress was slow. So much research and testing. I was fixed on the food stage for years. I was, (and still am), happily married and had 2 rapidly growing children. We owned a house with a fair-sized yard, so there was no shortage of stuff to do on any given day. There was a lot of responsibility. I kept plugging away at making changes. That nagging in the back of my mind would not go away. I didn’t want my 40’s to be a repeat of my 30’s. The routine of work, house chores, family time and then grabbing some married couple time with the odd social occasion thrown in was too frenetic. My work used up most of my time, everything else was jammed into what was left. That was backwards. Eventually I made it to the top of the pyramid. About 4 times a week, I do some kind of strength training exercise. Everyday, a brief amount of time is spent on quieting my mind. As the size and placement of these top 2 centre boxes indicates, they are the most challenging for me. But, I keep at it, not loosing faith in myself if I have a bad day or week. My definition of a creative life. This creativity blog is a bit unique. Most of what you find in the digital space is targeted to one thing, like art journals or cooking. Or there are professional creativity blogs which designers turn to for inspiration. There are very few inspiration resources for us normal, everyday people. Especially a site with span and scope. I think we are pretty multi faceted people, we have a lot on the go and it is all inter connected. I don’t want to tease out any one area as more important than others to the point of exclusion. So join me. I’ll take you on a creative journey. Areas of this site will quickly fill up based on the learning I have already done. Then, you will be surprised to see the places I will be going and the creative twists and turns I will take. Annemieke Cloosterman wrote this lovely piece on Mindstructures, ‘Why Creativity is an Essential Step in Human Development‘. There is a whole section on developing creativity that is worth checking out.